Never doubt the honor and sincerity of your vegetables. 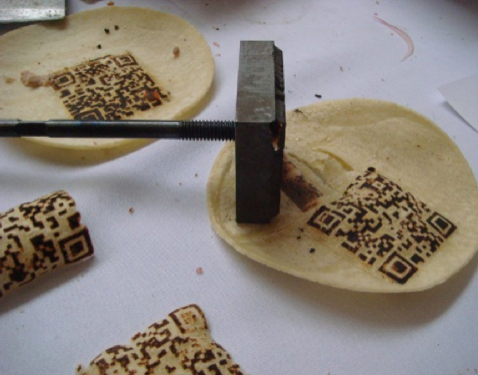 QR codes are branded onto tortillas at Taranta in BostoOn November 23, Polly Legendre will represent Polish Partnerships at the Creative City and Global Economy Conference in Tokyo as part of a panel on Innovative Society Empowered by Art, Design and Imagination. Polly will be presenting on the role of technology as a key driver in the new gastroconomy — where food culture and the economy meet. She will discuss how innovations from social media to QR codes have allowed a whole new chapter of the good food movement to flourish, from fishermen who tweet about their catch to chefs who turn QR codes into plated art. The Creative City and Global Economy Conference will explore the role of universities, cultural institutions, not-for-profit organizations and public/private partnerships in realizing a truly innovative society.The focus will be on Art, Design, Food, Education and the creative use of information and communications technology, social media, new technologies and social entrepreneurship. Hosei University, Keio University, Kanazawa Institute of Technology (Toranomon Campus in Tokyo) are the hosting institutions of the event and the steering committee consists of professors from these institutions. Major funding is provided by the Center for Global Partnership, Japan Foundation, a subsidiary of the Ministry of Foreign Affairs of Japan, in conjunction with special support from the American Embassy in Japan and additional funding from Hosei University. The conference takes place at Hosei University, Ichigaya Campus, and is free and open to the public.